Los Alamos researchers and a collaborator have made measurements during thunderstorms to study the affect of lightning on the lower ionosphere and radiofrequency signals. This study supports one theory for how tropospheric thunderstorms can create ionospheric disturbances that affect radiofrequency communication. Thunderstorms occur in the troposphere, the lowest region of the Earth's atmosphere, where most of the clouds and water vapor reside. Thunderstorms can affect radio communications at a much higher level of the Earth's atmosphere, the ionosphere. 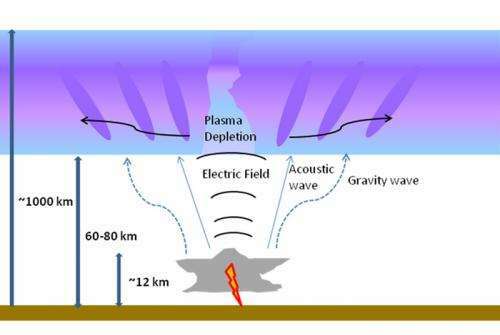 The partially ionized plasma of the ionosphere, which ranges from about 60 to 1,000 km, can "bounce" radio signals transmitted from the Earth.This property enables them to travel long distances over the horizon and can distort radio signals traveling to satellites important to communications, navigation or national security. 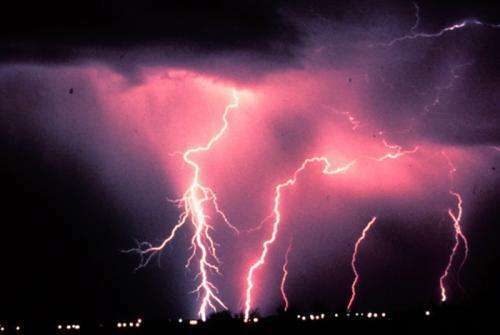 A thunderstorm and its lightning discharges create disturbances in the ionosphere that perturb and distort radio signals and impact communications with orbiting satellites. Theoretical simulations suggest that lightning's electric fields enhance electron attachment to molecular oxygen and reduce electron density in the lower ionosphere. Due to the low electron density in the lower ionosphere, active probing of its electron distribution is difficult. Therefore, the perturbative effects from thunderstorms are poorly understood. Schematic of how a thunderstorm and its lightning strokes in the troposphere affect the ionosphere. This study supports the theory that tropospheric thunderstorms create ionospheric disturbances through the influence of the electric field associated with the lightning. These findings indicate that enhanced electron attachment is responsible for the reduction in electron density. The perturbations affect radiofrequency communications and signals important for space-based nuclear detonation detection. Understanding the sources and impacts of ionospheric disturbances aids the Laboratory's fulfillment of its national security mission. The researchers deployed an array of six receivers, called the Los Alamos Sferics Array, in the Midwest to capture radio signals generated by lightning strikes associated with a thunderstorm hundreds of miles away. Lightning creates a radio signal (think about the crackle of static on an AM radio) that radiates outward in all directions. The array captured two portions of the signal, a ground-hugging portion that travels across the surface and reaches the array first and a portion that emanates skyward until it reaches the lower regions of the ionosphere, where the electrically charged medium bends the signal and reflects it back Earthward. This component travels a longer distance and reaches the array later. The characteristics of the reflected signal depend on the ionospheric properties in the local region centered above the midpoint between the lightning and the sensor. During the study, the thunderstorm generated about four cloud-to-ground lightning strokes per second at its peak activity. The lightning produced a large number of signals, which the scientists analyzed to determine localized, high-spatial resolution measurements of ionospheric conditions. The researchers compared the measured signals with calculated signals to determine the most likely value of electron density, a key parameter of the ionosphere for its effect on radio signal propagation. The team found that the electron density in the lower ionosphere decreased in response to lightning discharges. The extent of the reduction is closely related in time and space to the rate of lightning discharges. After the storm stops producing lightning, the lower ionosphere returns to its original condition in minutes through re-ionization. The team found that the electron density in the lower ionosphere decreased in response to lightning discharges. Why is this surprising? As the electric current flows through the plasma it will "harvest" or attract all of the electrons in the area by electromagnetic forces. Until it is acknowledged that lightning is but just a portion of the overall circuit linking the planet with the Sun any attempt to understand any part of the circuit will be futile. Nowhere in the article can I find the word "surprising." It's just you trying to put words in people's mouths again.